Who said a crumble can’t be savoury? 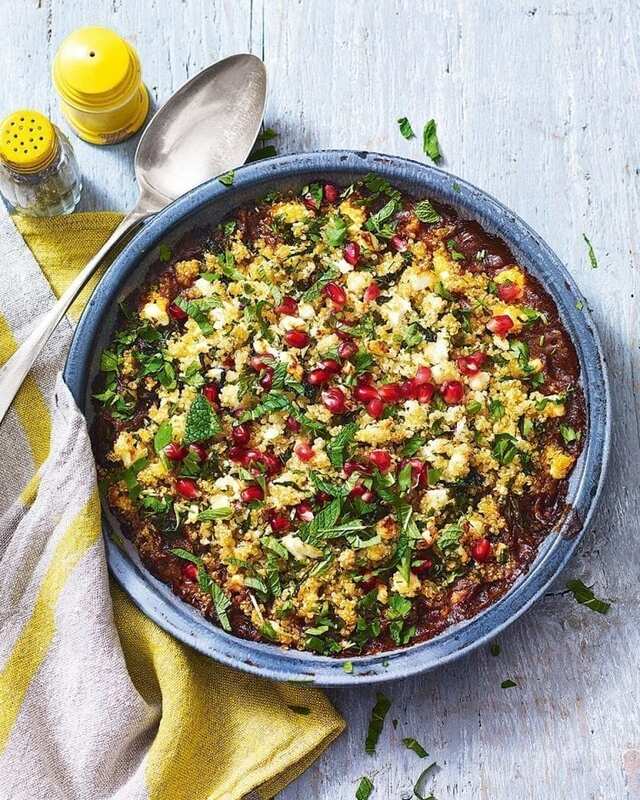 This one combines spiced lamb with a crunchy quinoa topping for an impressive Middle Eastern-style dish with a difference. Fry the mince, without oil, in a non-stick frying pan, breaking it up with a fork or wooden spoon as it browns. Transfer to a colander set over a bowl to drain. Wipe out the pan with kitchen paper, then add the light olive oil and heat. Cook the onion over a low heat for 10 minutes or until softened. Stir in the flour, spices, chillies, ginger and garlic, then cook for 2 minutes. Return the mince to the pan (discard the drained juices) and pour in the stock and passata. Bring to the boil, then turn down the heat and simmer for 25-30 minutes until the sauce has thickened. Meanwhile, simmer 150g of the quinoa in a medium pan of boiling water for 15-20 minutes, or cook according to the pack instructions. Drain well, then set aside in a large bowl for 5 minutes. Fluff up with a fork, then stir in the remaining 40g uncooked quinoa along with the extra-virgin olive oil, feta, lemon zest and most of the herbs (reserve some to garnish). Taste and season. Heat the oven to 190°C/170°C fan/gas 5. Pour the lamb mixture into a 1 litre ovenproof dish, then spoon over the quinoa crumble. Cook for 20-25 minutes until the topping is golden and the sauce is bubbling. Scatter over the pomegranate seeds and reserved herbs to serve. If you have some wine open (red or white), add a glug to the pan in step 2. The chillies add flavour rather than heat, so don’t be put off if you’re not a fan of spicy food. If you’re not keen on lamb mince use beef mince instead.